LUT Converter, AVI Joiner, AVI Splitter, MPEG Joiner, ASP Thumbnail Generator. We make and sell our software since 2000 year. 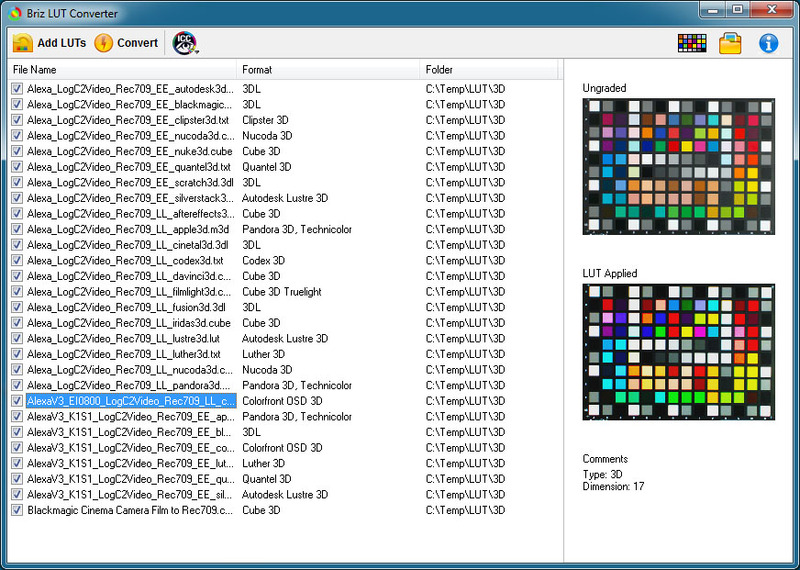 Handy software solution to convert 3D & 1D LUT files and ICC profiles from one format to another. Lets you to create a 3D LUT file that adjusts color grading of one image to a reference. Handy tool to match colors of two or more cameras for multi-camera shooting or broadcasting. Easy way to create your own 3D LUTs using paintings, photos or movie stills as reference. Easy-to-use tool to apply professional 3D LUTs to your photos. ASP (ActiveX) component that allows ASP applications to create high-quality thumbnails. The source DirectShow filter for Canon EOS DSLR cameras. Copyright © 2019 BRIZ Software. All Rights Reserved.